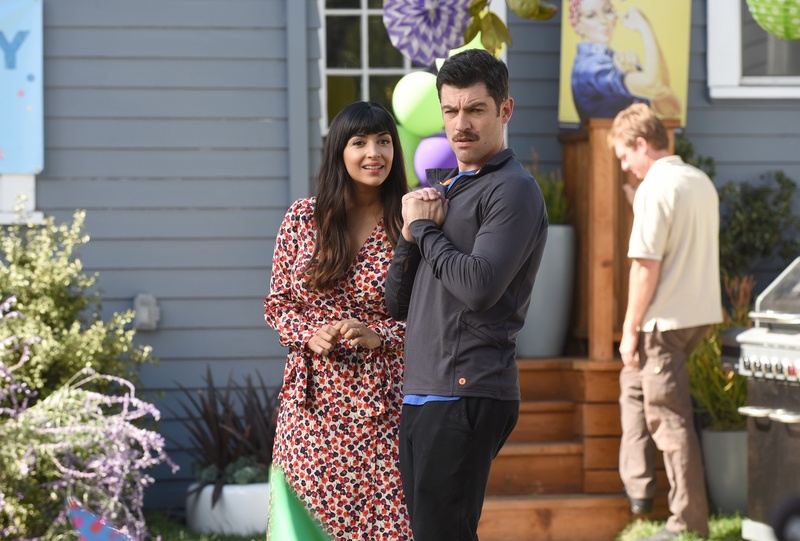 Cece (Hannah Simone) and Schmidt (Max Greenfield) anxiously assess their three-year-old daughter's birthday party in the Season Seven premiere of "New Girl" on Fox. In “About Three Years Later,” the Season Seven premiere of Fox’s “New Girl,” the storyline picks up—unsurprisingly—three years after the end of the previous season’s finale. Nick (Jake Johnson) and Jess (Zooey Deschanel)—still unmarried—have now been together for three years. Schmidt (Max Greenfield) and Cece (Hannah Simone) are married with a baby. Winston (Lamorne Morris) and Aly (Nasim Pedrad) are also married, and Aly is pregnant with their first child. Although in many senses, this season serves as an epilogue for the show, the lack of progress in Nick and Jess’s relationship hinders the otherwise-enjoyable premiere. Schmidt and Cece’s relationship is heavily featured in the episode. They behave more like a married couple than in previous seasons, showing that they are much more comfortable and confident with each other. Both have matured drastically, as they seem much more in control of their relationship. Schmidt, in particular, seems to have grown up the most. He organizes a feminist-icon-themed birthday party for his daughter Ruth—a huge leap from early seasons, when his character leaned heavily on his immaturity and sexual humor. Schmidt and Cece’s solid relationship is cemented as they rush around their daughter’s birthday party, handing out alcoholic “Ruth Bader Gins-burgs” and “Rosé the Riveters.” Their relationship maintains its hilarity and entertainment while still maturing over the three-year hiatus. Winston and Aly mirror Schmidt and Cece’s relationship, though to a lesser degree. They seem content and happy with one another, and even as Aly struggles emotionally with her pregnancy, the pair is able to navigate their struggles with honesty. Furthermore, Winston’s unique and endearing sense of humor continues to entertain, and is rather artfully sprinkled throughout the episode. Most of the episode’s conflict revolves around Jess and Nick: Though they continually mention that they have been in a healthy relationship for the past three years, the validity of this statement is constantly called into question throughout the episode. When asked by Russell, her ex-boyfriend, about their relationship, she lies, telling him that she and Nick are engaged. After Jess has a discussion with Nick about not needing to get married, Nick still tries to propose to her at 4 A.M. They continually fail to communicate with one another, and are unable to be honest with themselves and with each other. Though they are the main couple of the show and the main source of conflict, their lack of progress is incredibly frustrating, especially when juxtaposed with Winston and Aly’s and Schmidt and Cece’s respective relationships. While all of their friends mature and grow around them, Nick and Jess remain stagnant. With only one season left to go, it seems unlikely that Nick and Jess will finally reach a healthy level of comfort with each other and their relationship until the final few episodes. Outside of Nick and Jess’s relationship, Nick still struggles to be a mature friend. He finds he doesn’t like Schmidt’s new mustache, and publicly calls him out on it. He continues to be bothered by the mustache’s presence throughout the entire episode, yelling at Schmidt several times. Finally, when Nick angrily admits that he misses the bare-faced Schmidt, Nick yells “Are you happy now?” and slams the door. Schmidt happily responds: “No, Nick, not happy now. Happy forever.” Though Nick fails to act maturely around Schmidt, Schmidt continues to showcase his personal growth and reliability as a friend. In the season premiere, each character’s distinct and quirky personas remain, providing for a pleasing and enjoyable viewing experience. However, Nick and Jess’s inability to move beyond their relationship difficulties hinders the episode as a whole. As of yet, the show promises to satisfy die-hard fans, but a distanced viewing of the premiere leaves a bit to be desired.